Accept the decisions of officials and site directors with good grace. 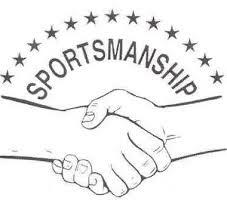 Demonstrate good sportsmanship before, during, and after games, win or lose. Represent oneself, the team, and the program in a positive demeanor. Be responsible for the sportsmanship of myself and teammates. And assist in maintaining a respectful environment for all participants. Be courteous to opposing teams, parents, spectators, officials, monitors, or facilitators and treat all with respect. Help to maintain and keep all equipment and conditions at the facility/park in good condition. Not engage in any behavior which would endanger the health, safety, or wellbeing of any player, official, staff member, parent, or spectator. Not initiate a fight, scuffle, or exchange with any individual (including but not limited to: pushing, shoving, punching, kicking, etc.). Not use alcoholic beverages or illegal drugs at any location. The decision of the officials and/or site director is final.